For years, science fiction has portrayed images of robots and appliances catering to every need and whim of human managers completely automatically. In some ways, 3D printers have represented the first steps toward such sci-fi visions of the future: simply punch in a design and the machine fabricates the object, as though out of thin air. For this reason, MakerBot dubbed its desktop 3D printer the “Replicator,” after the Star Trek device that could reconstitute matter into anything desired by the ship’s crew. Once the hype around desktop 3D printers wore off, the public learned that additive manufacturing (AM) machines require much more work than simply pushing the “print” button. This is particularly true of industrial machines. As impressive as they may be—producing complex shapes out of metal, plastic, ceramic and more—there is significant data prep and post-processing required just to ensure that parts come out as intended. Take a look at our article on the issues related to metal AM—ranging from warped parts to cracks and microscopic pores—and you’ll get an idea for just how nuanced the technology can be in the preparation stage. That doesn’t even begin to cover things like the need for wire cutting or CNC milling metal parts to remove them from their print platform. It’s no surprise, then, that before machines can automatically do everything for us, we’ll have to automate the machines even further. And this is exactly what a number of AM systems manufacturers are working on. To learn just how companies like 3D Systems, GE Additive subsidiary Concept Laser, Stratasys and Voodoo Manufacturing are automating their 3D printing technology, we spoke to representatives at the companies themselves. You’ll see from reading about these companies’ initiatives that the technology often involves automating the printers themselves and/or introducing robotic arms that assist in the production process. The end result, as far as the manufacturers are concerned, is increasing throughput, speeding up production, reducing the cost of operation and increasing production revenue. Utilizing desktop 3D printers, Brooklyn-based Voodoo Manufacturing is able to mass manufacture 3D-printed objects with much lower overhead than would be required with industrial AM systems. After perfecting a workflow associated with using cells of 3D printers—typically made up of about nine MakerBot Replicators, but now also including much larger N2 Plus systems from Raise3D—the company launched Project Skywalker. Skywalker seeks to make 3D printing at Voodoo more efficient by automating simple steps required once the printing process is complete. 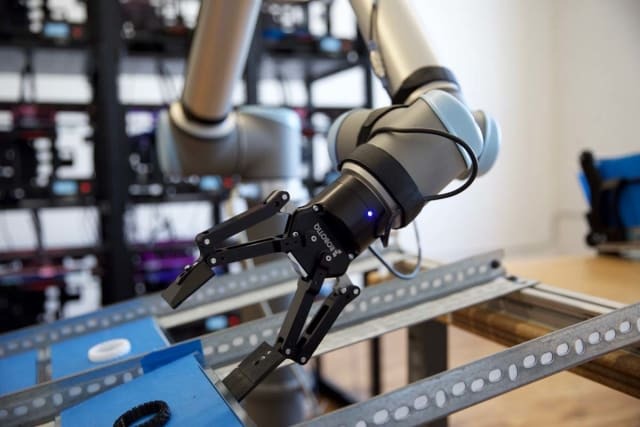 The project deploys a low-costUR10 robotic arm, from Universal Robots, which is situated next to a conveyor belt to remove prints from machines within a single cell. It then deposits the object (still attached to its printbed) onto the conveyor belt and places a fresh bed into the system, allowing the cell to operate 24/7 without human intervention. This “harvesting” process accounts for 10 percent of the total work taking place in the factory, resulting in a 3x productivity boost for all of the machines that are being run with robotic arms. When Voodoo employees arrive to work each day, they simply collect the batch of parts made overnight, remove them from their beds, and perform the post-processing required to ship the parts off to customers. To pull off the harvesting process, the robotic arm has been programmed with predetermined paths before using machine vision to accurately approach the printbed and remove the part from the machine. Voodoo has also developed software that partially automates the file prep process, orienting the 3D model, determining the print settings, placing it into the print queue, and sending it to the proper printer in the queue. Schwartz explained that automation is being increasingly pursued in AM due to the cost-per-part inherent to the technology. In the past, prototyping with 3D printing made sense, due to the fact that very few components would be made before heading to mass manufacturing with a technology capable of making many parts at once for a much lower cost, such as injection molding. However, as AM is now being used to create engineering-grade parts, steps need to be taken to make the process more scalable. “The main goal of [Project Skywalker] is to have it deployed in the factory, tending our machines 24/7, and, as a result, increase our factory output and utilization. That will, over time, increase our cost competitiveness with injection molding for higher volume runs,” Schwartz said. At the same time that Voodoo is looking to compete with injection molding in terms of cost, the Voodoo factory is also bringing the benefits of 3D printing to batch production. Not only can the 3D printer cells fabricate geometries that are impossible to make with any other method, but it can do so en masse, executing the concept of mass customization. With each 3D printer producing unique parts, Voodoo is making batches of custom objects all at once—something that is also impossible with other manufacturing technologies. Limiting the robotic arm to a fixed position, however, prevents the arm as well as Voodoo’s factory from achieving its full potential. 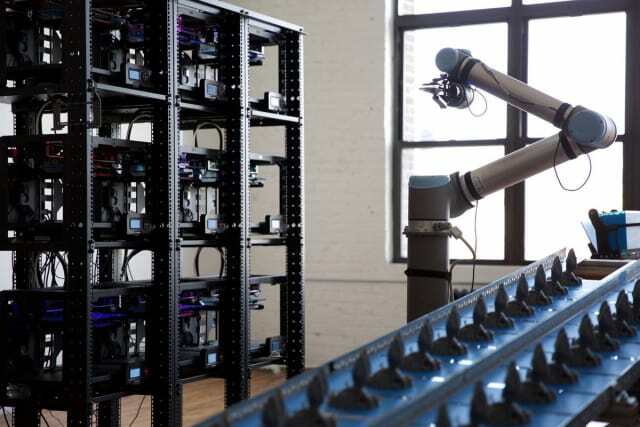 That’s why the company is developing a system in which robots can actually drive around the entire factory space, giving it the potential to expand from just nine printers in a single cell to 100 printers throughout the factory. Within the next year, he believes that the vision of a single robotic arm driving around the factory and tending machines will become a reality. As the company has expanded from MakerBot machines to other systems, Schwartz explained that the Skywalker system has been designed flexibly. This was one of the reasons that Voodoo chose such a low-cost robotic arm. 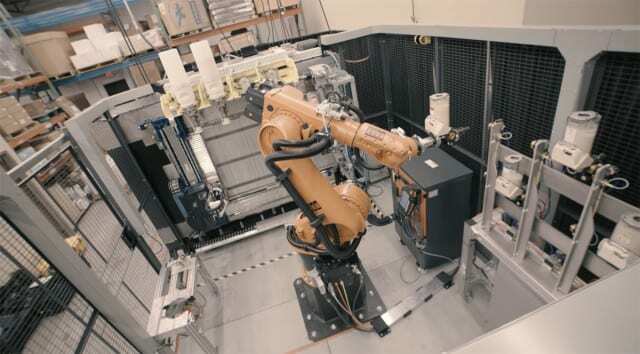 Unlike large-scale industrial robotic arms, the UR10 can be quickly adapted to a new process. The arms aren’t as fast or powerful as the type that swing around car chassis on automotive assembly lines, but they are easier to integrate into an existing factory environment. Therefore, as Voodoo evolves, so too can the Skywalker system. At RAPID+TCT 2017, Stratasys unveiled what almost resembles an industrial version of Voodoo’s original print farm: the Continuous Build 3D Demonstrator. The system consists of a scalable series of fused deposition modeling (FDM) 3D printers that continuously print batches of parts. Once complete, the parts are then ejected from the machines and new print jobs are initiated. The system features automatic queue management to balance jobs across the print farm, so that if a job fails on one machine, another printer will start it again.Customers already using the platform include Savannah College of Art and Design and manufacturing service providers In’Tech Industries and FATHOM. To automate the system for lights-out production, the system can open and close the doors to the printers on its own, as well as start printing automatically. The Demonstrator also features a stream of build sheets that are ejected when prints are completed. 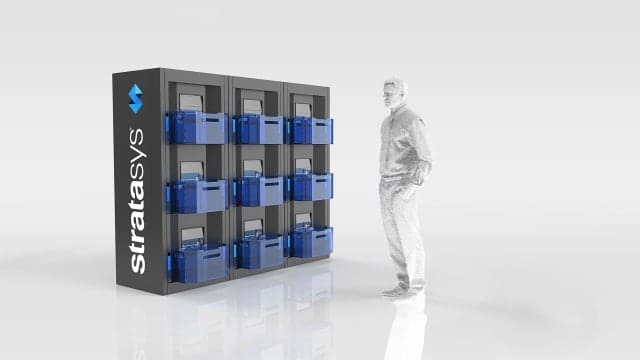 Beyond the Continuous Build Demonstrator, Stratasys has taken steps to make other FDM technologies more suitable for a production environment, as well. Though large-scale robotic arms may not be ideal for the setting that Voodoo envisions, industrial applications may call for industrial measures. 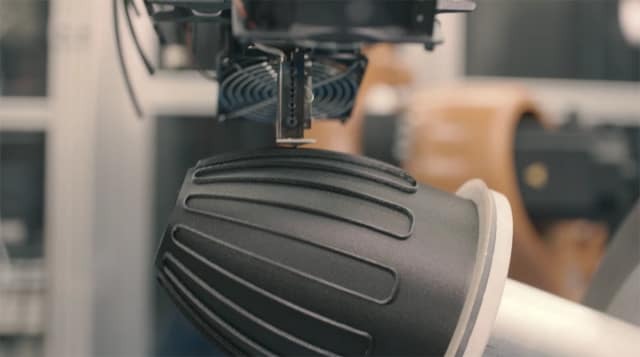 Stratasys has begun developing AM solutions that rely on industrial robotic arms, which may ultimately see AM integrated into factory settings that already rely on such large robotic systems for other manufacturing purposes. The Infinite Build Demonstrator, unveiled in 2016, uses an industrial robotic arm to refill the machine’s material hopper as it prints objects with hypothetically long lengths. This allows the machine to be reloaded throughout a night or weekend, without the need for human intervention. Additionally, if a deposition head needs to go down for repair, the arm can swap in a new one, as well. With the Robotics Composite Demonstrator, Stratasys incorporates a robotic arm into the actual architecture of the 3D printing head. The system extrudes a composite material onto a printbed that can rotate on five axes, ensuring that the reinforcement fibers of the material are facing the optimal direction while also adding flexibility to how objects can be fabricated. Currently, composites manufacturing is a labor-intensive and costly process, making automation highly desirable. For this reason, multiple companies, such as Markforged and Impossible Objects, have developed composites 3D printers. Sevcik highlighted the fact that none of the demonstrators are limited to the configurations displayed publicly. For instance, the Continuous Build system could be used with other types of 3D printers. An advantage of the Robotic Composites Demonstrator is the fact that it relies on pellet feedstock, rather than a filament, and extrudes material at a quicker rate than filament-based machines. Sevcik explained that this technology could likely be ported over to other systems as well. Like Stratasys, 3D Systems has found benefits to introducing industrial robotic arms to the 3D printing workflow for its Figure 4 platform. While the first industry-specific market introduction of the Figure 4 machine is a stand-alone printer, 3D Systems has showcased numerous configurations in which robotic arms assist in the production process. The Figure 4 Production series includes multiple printers and robotic arms that transfer completed parts from the build platforms to a post-processing station, where additional UV curing takes place. 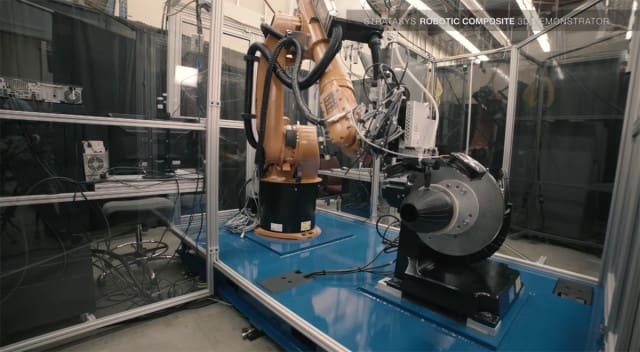 The company has even demonstrated a part inspection module, in which a robotic arm rotates a completed part in front of a scanner, which matches the part against its 3D model to ensure accuracy. In the Production series, the material delivery process is also automated. 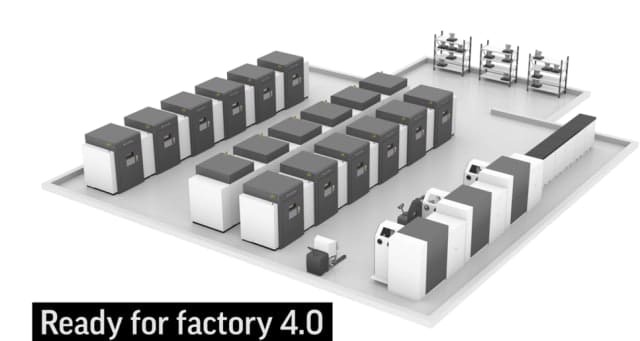 In addition to the factory environment, there is a modular version of Figure 4 that features a centralized control station that can coordinate production between “localized print engines at individual workstations.” The technology is designed with the “job shop” environment in mind, with the idea that employees can support production at each station. Then, there is the stand-alone Figure 4 3D printer, which is meant for low-volume production. Though automation is essential to increasing throughput and decreasing downtime for the printers in the Figure 4 system, the continuous digital light processing (cDLP) technology, as well as the materials, also play a role. Because there are no discernible layers in a part made with cDLP, there is less post-processing required to ensure the part meets visual criteria and physical tolerances. 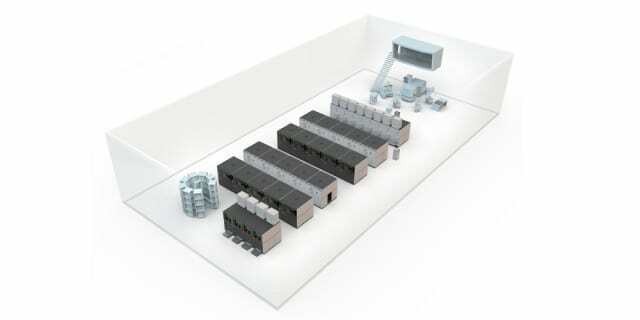 The solution is made up of several modules, including Printer Modules for fabricating parts; Removable Print Modules (RPMs) for transporting powder to printers and parts from printers; Powder Management Modules for de-powdering parts on the build platforms before recycling unused powder for future print jobs; and Transport Modules that move RPMs between the printer and powder modules. 3D Systems is not the first company to conceive of such a concept. 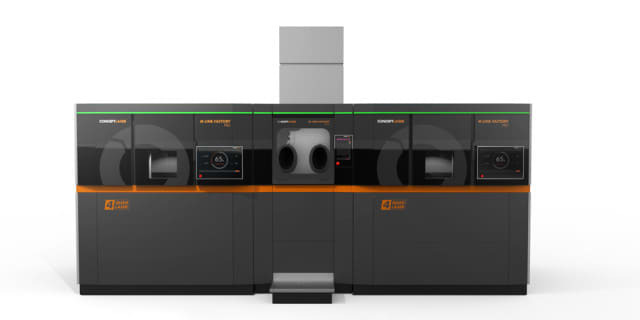 The first may have actually been Concept Laser, the GE-acquired metal 3D printer manufacturer. Concept Laser unveiled its AM Factory of Tomorrow concept in 2015 and is in the process of developing the modules associated with the technology. To balance footprint with productivity, Concept Laser unveiled several solutions in 2016. The M LINE FACTORY PRD, a production unit with three modules for loading powder, printing a part and receiving powder overflow—all connected by an interior tunnel system. The machine also includes four lasers, “to guarantee faster builds and higher productivity, and ultimately a lower cost per part,” according to Kaczmarzik. This system automatically moves powder in and out of the print chamber without interrupting a print job, further increasing the productivity of the printers. In the future, Concept Laser may incorporate an automated tool changer that would make it possible to combine AM with subtractive manufacturing. This system is complemented with the M LINE FACTORY PCG, a self-contained, closed unit in which an operator can sieve powder for new prints or unpack completed prints without handling the powder itself. 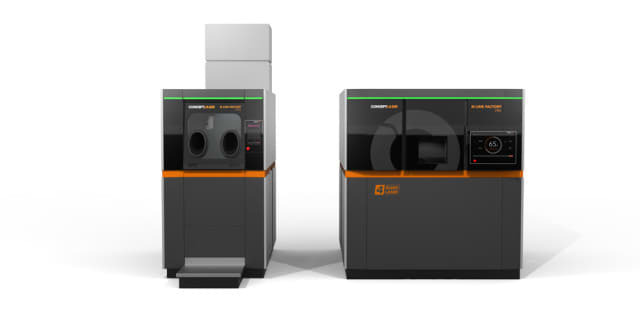 The system is designed so that a finished print can be sent to the PCG, while the PRD begins working on a new part.A series of these machines adds up to the AM Factory of the Future, wherein the systems are all networked and controlled with a single tablet. Kaczmarzik pointed out that not every part of the M LINE FACTORY solution is automated, including removing powder from the printed part and transporting modules between machines. Concept Laser plans to “industrialize and automate the system until we are able to offer a fully automated Factory of Tomorrow,” Kaczmarzik said. To better understand the way that automation fits into the larger industry picture, we spoke to Davide Sher, CEO and founder of 3D Printing Business Media and senior analyst at SmarTech Markets Publishing. Sher believes the automation trend is a part of the larger transition of 3D printing into a production technology. And not just an isolated one. "Most operators are no longer thinking of 3D printers as stand alone machines but as part of an end-to-end production workflow which includes: material handling systems, multiple additive manufacturing systems, part handling systems, part cleaning systems, curing/heat treatment systems, support/powder removal and recycling systems, part inspection systems and part finishing systems," Sher said. "This transition is happening at a software level as well with CAD/CAM/CAE software feeding into Simulation, MES (manufacturing execution systems) and PLM software tools. This is a natural transition as 3D printers shift from being stand alone prototyping devices to production machines." According to Sher, automation will increase more systems sales, as "there is a direct relationship between the number of systems on the premises and the production rate capabilities." Areas of the industry that are currently neglected, such as part finishing and handling, will become more important, as well, Sher said. In turn, the robotics industry operators will gain a more important stake in the AM production workflow. It’s impossible to talk about automation without discussing labor displacement. According to an Oxford University study, “47 percent of jobs in the U.S. are ‘at risk’ of being automated in the next 20 years.” This includes not just tasks that can be performed by industrial robotic arms, but even artificial intelligence that is capable of replacing call center operators and even junior lawyers using natural language processing. When asked about how they would address these concerns, each company representative who was interviewed gave some variation of a similar answer: automation of some technologies will free up other areas of employment and even create more jobs. For instance, Scott Sevcik from Stratasys said that, once hand layup of composites is automated, there will be greater demand for engineering skills related to designing parts and evolving the 3D printing processes that replaced hand layup. “There will be automation of some skilled labor that is no longer required, but also an opportunity for operating these systems and maintaining these systems and driving them forward,” Sevcik said. While there may be more job opportunities created in other areas as automation increases, there may still be concern among current employees with regards to job losses. A job opportunity in one division of a business could mean a job loss in another, with a machine operator let go, while a new marketing or sales person is taken on. Davide Sher said that he doesn't believe there is a direct link between automation of industrial manufacturing and overall job losses, saying that other professions, such as performing basic medical or legal analyses, are easier to automate than complex manual labor. "[S]o high level manual jobs may be the last to be taken over by automation. New jobs will be created in the development of automation software and hardware tools while factor workers will continue to evolve into highly specialized machine operators," Sher said. "In a theoretical world where fully optimized production processes make manufacturing fully sustainable there is no limit to how much a super-society could produce (there is an entire universe out there to colonize), so better production practices could mean more jobs, rather then less jobs." Schwartz also underscored the fact that new maintenance tasks would be required, as operational tasks are automated, but indicated that machine operators play an increasingly important role in the engineering decisions made regularly. Voodoo also plans on investing in training its staff to ensure that the skills of its workers keep pace with the jobs required within the company. Voodoo employees will surely be relieved to know that not only may their jobs be safe, but that automation can mean increased upward mobility within the company. Not every company within the AM industry, however, will make the same promise.